I was originally introduced to Herbaria by Bionic Beauty’s glowing review of an extraordinary hand-made soap company in Missouri. After visiting Herbaria’s web site, I was impressed by the knowledge that goes into each of their 34 soaps. From Almond Green Tea to Spearmint Orange, each soap is uniquely crafted with pure ingredients to provide proven benefits to your skin.At Herbaria, if you purchase 6 bars, you will receive one free. The hard part is choosing only seven! My first pick was the Sassafras Birch soap. As a girl from Indiana, I have always been fond of the Sassafras tree and the products derived from it. Sassafras was the original flavoring in Root Beer, so you can imagine that this soap has a warm, spicy scent. The root beer scent, also associated with birch beer and sarsaparilla, comes from essential oil of white birch. The hint of wintergreen is also from birch. Ground sassafras root and bark is added to the bar to lightly exfoliate the skin. The sassafras also makes the bar a lovely purple shade. 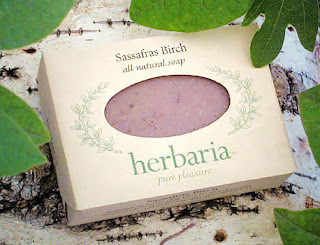 Like all Herbaria soaps, Sassafras Birch is first and foremost a great soap with terrific lather and moisturizing hemp seed oil. When the package of soaps arrived at my door, my kids wanted to sniff and try each of them. The Sassafras Birch was the clear favorite. Sarah and Naomi both loved its sweet and warm root beer scent! I personally love how nicely the soaps lather and clean without stripping my skin. My favorite has been the Almond Green Tea bar which feels nourishing, has a smooth texture, and is a sensual soap to use. This soap left my skin feeling smooth and smelling delicious! Herbaria soaps are truly wonderful, all created and made by Ken and LaRee who are as authentic and wonderful as their products! Visit Herbaria’s website. A box of their soaps is a must and would make an incredible gift for the holidays. Entry filed under: family, Skincare. Tags: Almond Green Tea, Bionic Beauty, Favorites, Gift Ideas, Handmade Soaps, Herbaria Soaps, Holiday Gift Ideas, Missouri, Natural, Natural Soaps, Organic Soaps, Root Beer, Sassafras, Skincare, Soaps. I’m glad you liked them as well. My husband is now even wondering how we used “regular” soap for so long, lol!